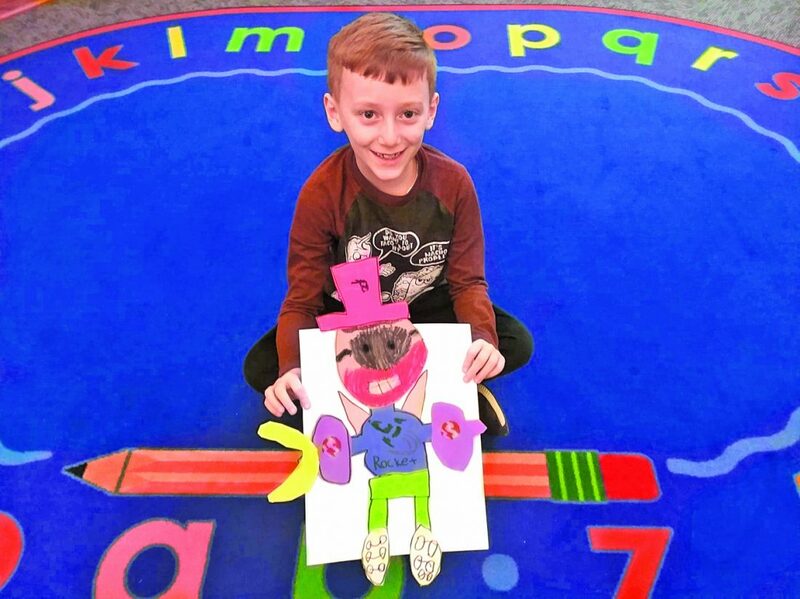 Courtesy photo Dominic Baker, 8, holds his “Rocket” superhero created in Cory Geishauser’s Art Funshop held recently at the Hollidaysburg Area Public Library. Dominic is the son of Brodie and Stephanie Baker of Hollidaysburg and attends Holy Trinity Catholic School, Hollidaysburg. Funshop art will be on display in the library’s community room throughout the month of February. HOLLIDAYSBURG — The Hollidaysburg Area Public Library has announced its February events. Library hours are 9:30 a.m. to 8 p.m. Monday through Thursday, 9:30 a.m. to 5 p.m. Friday and Saturday and 1 to 5 p.m. Sunday. The library will be closed Feb.16, 17 and 18 in observance of Presidents Day. The library follows the weather closings of the Hollidaysburg Area School District. Check the library’s Facebook page in case of inclement weather that may affect program cancellations. n Ancestry: Library Edition is available for the public to use, free, on the library’s public computers. n Artwork by students of Cory Geishauser’s cartooning classes will be displayed in the community room during the month of February. n The Handwork and Arts Group (adult crafting club) meets from 12:30 to 2 p.m. Tuesdays. Take your own materials and projects; call Janice at 695-2281 for more information. n The Knit Wits Knitting and Crocheting Club meets from 6 to 7:30 p.m. the first Thursday of each month. Take your own materials/projects; no signup is needed, visit the club’s Facebook page for more information. n The Canasta/Mah Jongg Club will meet from 11 a.m. to 2:30 p.m. each Thursday in February. Beginners are welcome; call 693-9292 to sign up. This program is intended for adults. n Free Tech Help will be provided from 10 a.m. to noon Feb. 2 and 23 to help with technical questions on laptops, tablets, cell phones and other devices. No signup needed; first-come, first-served, call ahead for availability. n The ABC Photo Society will meet at 7:15 p.m. Feb. 4 and 25. Visit abcps.club for meeting topics; all are welcome. n Story Times will be held at 6 p.m. Feb. 4, 11 and 25 and at 10:30 a.m. each Thursday and Friday in February. No signup needed; children must be accompanied by an adult. n “Smartphone Help!” will be held from 3 to 4:30 p.m. Feb. 5 and 26. Tyler Zorger from Verizon Wireless Zone, Hollidaysburg, will teach this free class. It is a pressure-free environment to learn more about your smart devices. No signup needed; take your phone and charger, and questions. n “Winter Wednesdays ROCK” intergenerational drop-in program will be held from 3:30 to 4:30 p.m. Feb. 6, 13, 20 and 27. All ages are invited to paint rocks to place in public places for finders to keep or rehide. Post pictures of completed rocks to Facebook: Central PA Rocks. n Allegheny Essential Oils Club will hold free classes from 6 to 7 p.m. Feb. 6 (“Pain Management”) and Feb. 20 (“Cooking with Essential Oils”). All are welcome; visit the club’s Facebook page for more information. n The Friends of the Library will meet at 10 a.m. Feb. 7. All are welcome to attend and meet the members of the Friends of the Hollidaysburg Area Public Library. n Ceramics classes will be held at 6 p.m. Feb. 7 (“Animals”) and Feb. 21 (“St. Patrick’s Day”). Kathy Brua of Fired Up Ceramics Co. will provide a variety of project choices and all materials needed at a cost of $6 per project. All ages welcome; children can participate with adult supervision. Call 935-5490 to sign up/reserve your project choice. n “Crafternoon Make & Take,” an intergenerational drop-in program for ages 8 and older, will be held from 3:30 to 4:30 p.m. Feb. 7, 14, 21 and 28. It is not for young children; this is not a class but an opportunity to experiment/create with a variety of materials that change each week. Wear appropriate clothing for crafting; no signup needed. 1 to 4 p.m. Feb. 9 and 23 and March 9 and 23. Ages 12 to 18 are invited to participate; there will be activities and snacks; signup is required; space is limited. Email tlc@icloud.com to reserve your student’s space. Teen Reading Lounge is provided through a grant from the Penn-sylvania Humanities Council, in partnership with Benzel’s Bretzels Inc., and support from Keller Engineers Inc.
n The Mystery and Mayhem Book Club will meet at 2 p.m. Feb. 12 to discuss “Reconstruct-ing Amelia” by Kimberly McCreight. Copies of the book are available for purchase at the library. n “Music With Marabeth” will meet at 10:30 a.m. Feb. 14. Children and their grownups are invited to come sing, dance, wiggle and giggle with Miss Mara-beth including fun with egg shakers, rhythm sticks, hula hoops and more. No signup needed; children must be accompanied by an adult. n The Inspirational Book Club will meet at 6:30 p.m. Feb. 14 to discuss “Runaways” by Brenda C. Poulos. Copies of the books are available for purchase at the library . @msn.com. No signup needed; all are welcome. n “E-book Training” will be held Feb. 21. Schedule an individual appointment between 2 and 5 p.m. to learn how to get new, free e-books and e-audiobooks using your iPad, Android Tablet or smartphone. Sign up by emailing dlc@altoonalibrary.org or by calling 946-0417, ext. 134.
n “Revisiting the Founding Era for Teens” will be held at 6:30 p.m. Feb. 21. Glenn Nelson, executive director at Fort Roberdeau, hosts this free discussion group for teens and young adults about our Founding Era/how the ideas and themes behind historical documents continue to influence our lives today. This nationwide program is a project of the Gilder Lehrman Institute of American History/American Library Association/National Constitu-tion Center, supported by the National Endowment for the Humanities. n Homeschool History Fair will be held from 1 to 3 p.m. Feb. 22. Students give a short (two- to three-minute) presentation on a historical subject of their choice, including visual displays, costumes, and demonstrations. Local homeschool and cyber school families are invited to present, and the general public is invited to attend. For more information, email melanie@halibrary.org. n A free movie showing of “Grease” (PG-13, 1978, one hour, 51 minutes) will be held at 6 p.m. Feb. 22. No signup needed; snacks will be provided. n A “Wine, Trivia & More” fundraiser will be held from 6 to 9 p.m. Feb. 23 at the American Legion Social Hall, Legion Park, Hollidaysburg. It will include a dinner buffet, small games of chance, basket raffle and a door prize. Tickets (age 21 and older) are $25 per person, available at the library. Tickets are limited. n Ukulele Jam will be held from 2 to 4 p.m. Feb. 24. The Allegheny Ukulele Kollective invites all interested people to attend; there will be ukuleles available to use. Email alleghenyukes@gmail.com for more information. n The Best of Times Book Club will meet at 2 p.m. Feb. 28 to discuss “Ordinary Grace” by William Kent Krueger. Copies of the book are available for purchase at the library. n Free library tours are available upon request for individuals or small groups. They include a guided, inside peek at the library’s holdings and resources. Email janet@halibrary.org to RSVP/schedule a free tour during regular library hours. n The public is encouraged to support the library’s winter fundraising: Gardner’s Chocolates, Sheetz coupon booklets, soup basket raffle and Best of Friends Bookstore.